Tomorrow marks the one-year anniversary of San Francisco and Oakland filing their public nuisance lawsuits targeting a handful of energy manufacturers. Since that time, other municipalities and one state have peddled the same misguided legal theories in front of judges across the country in search of headlines, press conferences and ultimately big paydays. 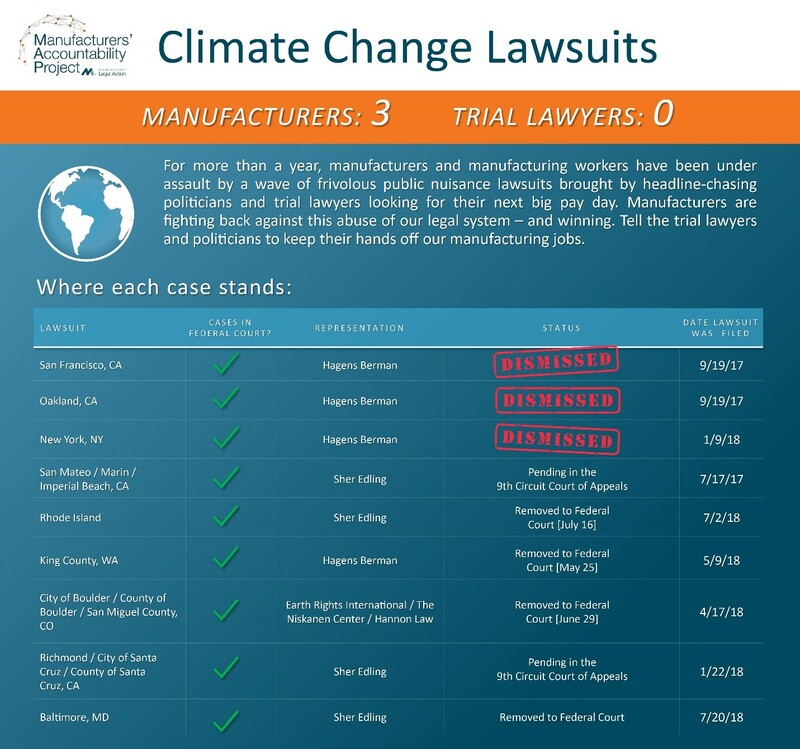 To date, three of these lawsuits have been dismissed, setting a strong precedent for the other lawsuits awaiting their day in court. Although the cities in all three cases are appealing the dismissals, there is no reason to believe any of these appeals or any of the other cases will produce a different result, as they all rely on a misguided understanding of “public nuisance” lawsuits. But if just one succeeds, it would have serious consequences for manufacturers. The allure of a potential large award for trial attorneys means that, despite their many recent victories in the courtroom, manufacturers will likely face more of these baseless lawsuits in the future. This is one reason why MAP is calling for pre-emption legislation, transparency and withdrawal of these lawsuits to protect manufacturers from these attacks and put an end to this dangerous trend. Below is an overview of where each lawsuit currently stands, with Baltimore being the most recent lawsuit removed to federal court.